Temperatures in the Ozarks will continue a slow creep upwards into the Labor Day weekend. We will add a few more degrees to the high temperatures for the next few days, putting us up in the middle nineties on Saturday and perhaps Sunday. 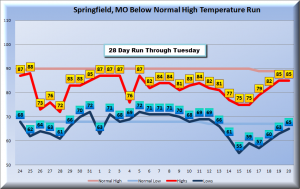 As of yesterday, Springfield has logged 24 ninety-degree days. The Labor Day weekend will start hot which is great news for all lake and pool folks. But cooler air will trickle in for Labor Day itself, a welcome break from the latest heat. Along the way, a few isolated to scattered showers and storms are possible on Sunday. This activity doesn’t look very widespread at this point. The cooler air will last into the middle of next week. Highs will return to the eighties. Our latest run of hot temperatures will last most of the Labor Day weekend. It has been hot but not terribly so. Readings are only a few degrees above the long term average and the humidity only moderate by summer standards. The temperatures will continue their slow creep upwards over the next few days. Middle nineties will be possible by Saturday. 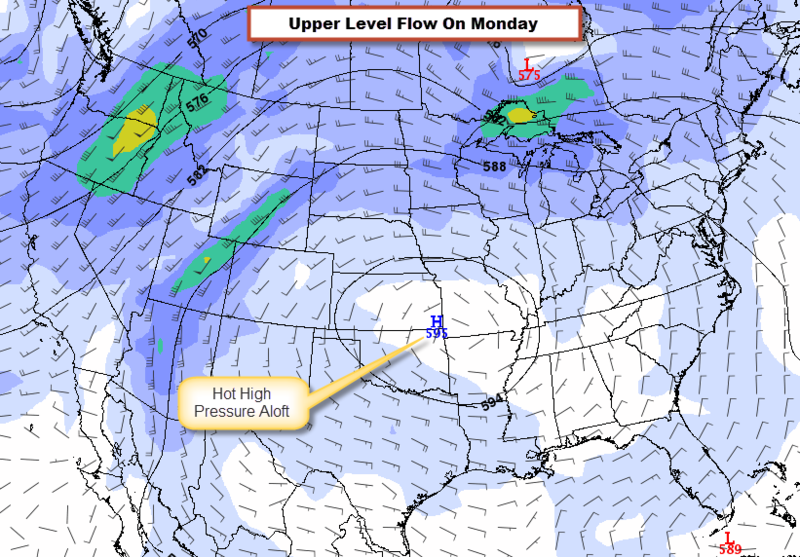 The upper level high responsible for the hot and dry weather is showing some signs of backing westward by late in the weekend. Two longer range computer models are in agreement on this trend although one is more enthusiastic about it than the other . This would mean temperatures will back off slightly by early next week. Rain chances are not great but there are some widely scattered possibilities but late in the weekend. Not enough to change a plan! This weather pattern is very predictable and the prediction is hot! This will end up being the steadiest hot pattern of the summer with a string of ninety-degree days setting up. All showers, storms and even clouds are rotating clockwise around an upper level high pressure system over the central U.S. This will mean no cool fronts in our future for the rest of the work week. The temperatures will creep up each day. Conditions will have to be monitored for a heat advisory on a day-by-day basis. There might be a “backdoor” cool front over eastern Missouri this weekend. These come in from the east or northeast. I wouldn’t put much money on this front making a difference in temperature although it might bring an isolated storm chance for some. Hot Bubble Over the Ozarks! Our area will continue to experience hot temperatures for the next seven days. 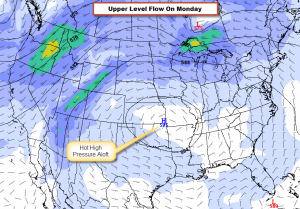 A ridge of high pressure in the upper atmosphere is setting up shop right over the Ozarks through this week and into the weekend. ‘This will ensure highs in the lower and middle nineties during this period. Rain chances are near zero too! For the next seven days, the Ozarks will be under the influence of a hot and dry weather pattern. 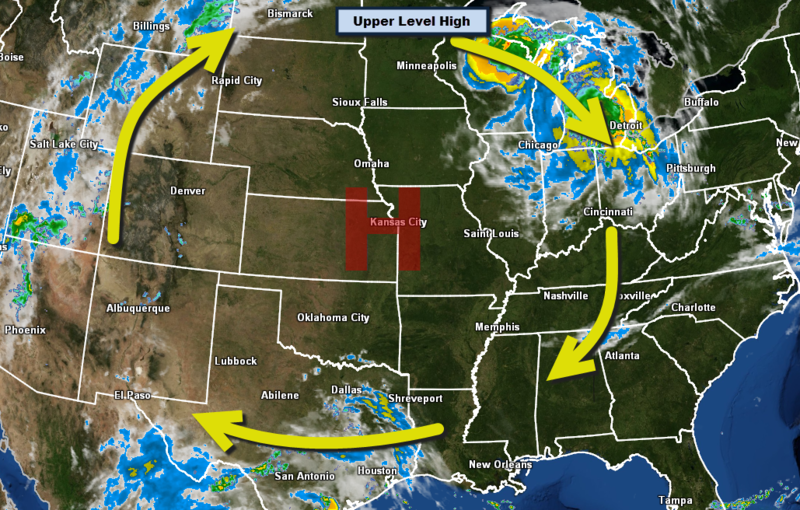 A bubble of high pressure in the upper atmosphere will park over the Ozarks for at least the next seven days. This will mean a run of highs in the nineties will set up over the area. I expect consistent highs in the lower nineties by next work week. 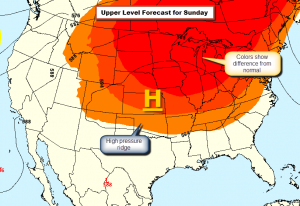 The center of the hottest temperatures parks more squarely over the Ozarks by Sunday and Monday and then shows some signs of shifting more westward later in the week. The differences will be minor temperature changes from day to day. Humidity will be about average through all of this. The need for heat advisories will just have to be watched from day to day. As forecast, this would be the longest stretch of nineties this summer. The longest runs where 5 days in row in July and June. 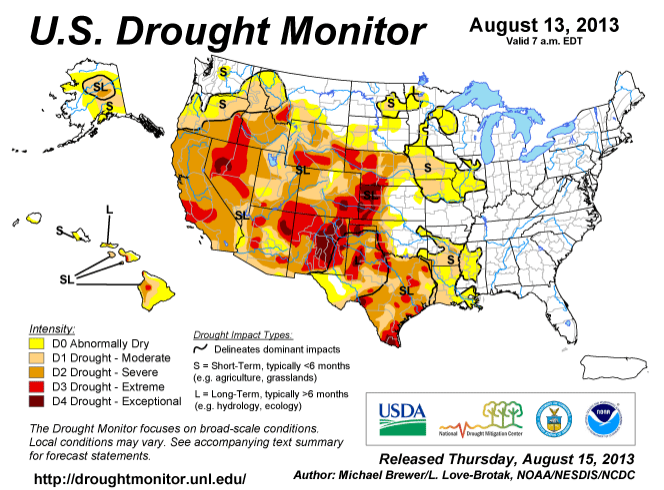 It’s not too hard to see why the drought has been eliminated over the Ozarks as seen on the latest Drought Monitor update. Just compare the drought map to the rainfall accumulation over the past thirty days. 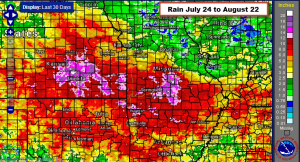 The rain belt matches the non-drought belt pretty well! The weather pattern has changed since that wet period ended. We have gone the longest number of days without rain in Springfield (10 days as of today, Thursday, 8/22) since back in late June with more dry days in the forecast! 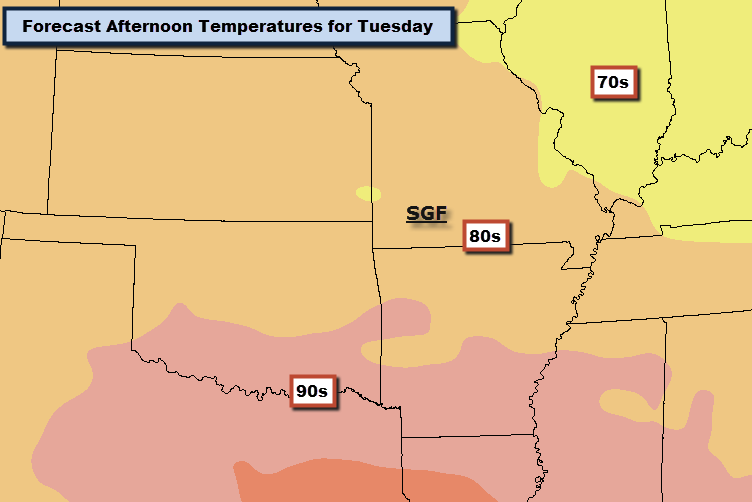 Don’t look for a lot of surprises in the weather over the next seven days as summer temperatures park over the Ozarks. We are about to wrap up a run of below normal high temperatures which is now at 29 days. If the streak doesn’t end today, then it certainly will over the next few days. The cool temperature run featured no nineties and a lowest low of 55° on the 15th of August. Now, a ridge of higher pressure aloft will mean a return to slightly above normal temperatures and basically a summer pattern of weather. I see a very gradual climb in temperature over about the next days days. 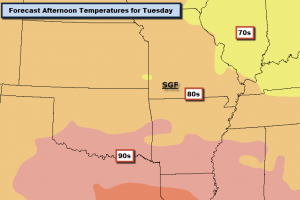 My forecast puts lower nineties in the Ozarks for much of next week. Rain chances are minimal. A weak cool front sliding into eastern Missouri from the east on Friday could spark an isolated shower off to the east of Springfield but it’s a long shot at best. The humidity is building however it appears the combination of this humidity and the forecast heat won’t be enough for advisories for the most part. It will be tracked on a daily basis. 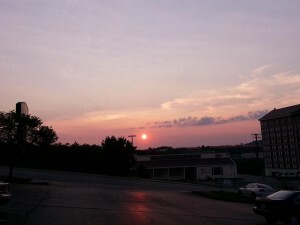 Finally, did you notice the red moonrise and sunset last night? 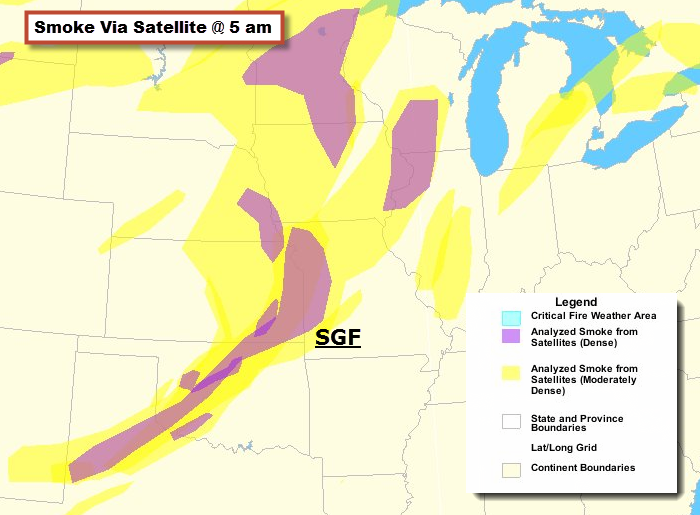 Smoke from western forecast fires appears to be adding an extra reddening to these events! The Ozarks is beginning a warming trend which will bring back above normal high temperatures for the first time in about a month. We have had no nineties in August with 18 ninety-degree days for the year. 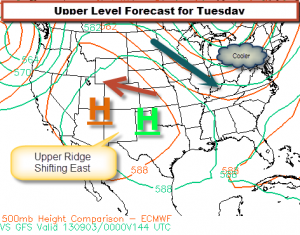 The missing element for hotter temperatures has been a ridge of high pressure in the upper atmosphere. 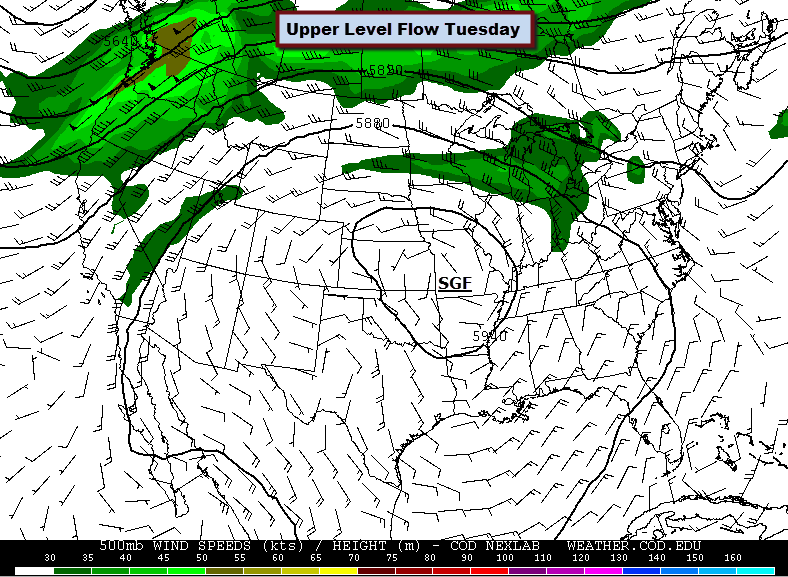 This feature will be building over the Ozarks over about the next week. I don’t expect excessively hot conditions and the humidity, while forecast to be slightly higher, doesn’t look unbearable over upcoming week. There is a shot at a rain shower as showers and storms forming well to our north slide around the ridge aloft. This is a long shot at best and is more likely in eastern Missouri. The first time this might happen is on Friday. Summer weather left us for about a month but now it’s coming back with a run of hotter temperatures. Having stated this, I don’t think the heat will be terrible, just different from what we’ve experienced lately. I look for high temperatures to return to the nineties by Thursday and stay there through the weekend and probably much of next week. Lower nineties will be common. Humidity will be higher but I don’t see it excessive at this point. In short, typical summer conditions will set in. Along with all of this, rain chances have shut down for a while. I don’t see any significant chances for rain during the forecast period. The run of below normal high temperatures we’ve experienced will end later this week as summertime heat builds back into the area. 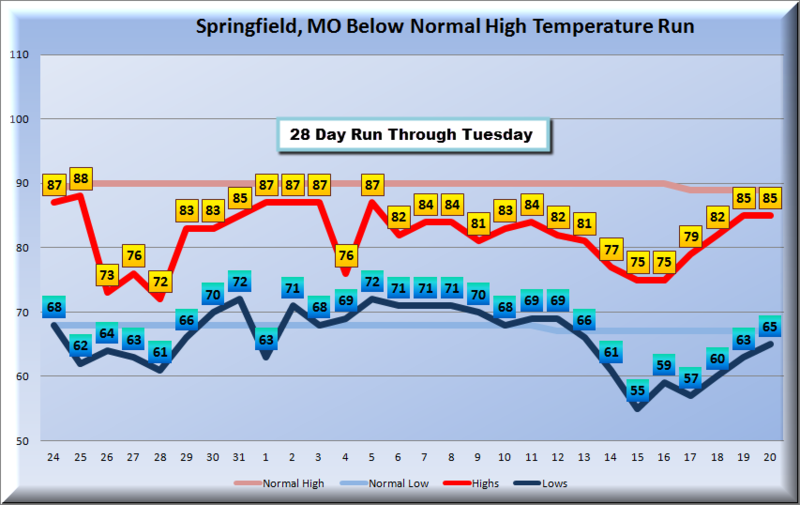 Since July 24th, the high temperatures in Springfield have stayed below normal. That puts the run of relative cool at 26 days. We probably have two more to add before the streak ends. 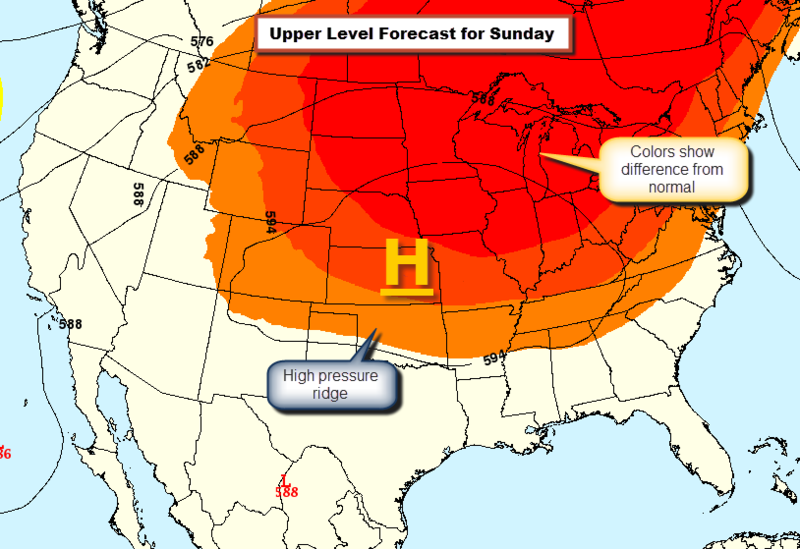 This week, a ridge of high pressure is building over the central U.S. Some computer models center it up over our area by Saturday and Sunday. It looks like a return of highs in the nineties is in the cards for late in the week and into the weekend. 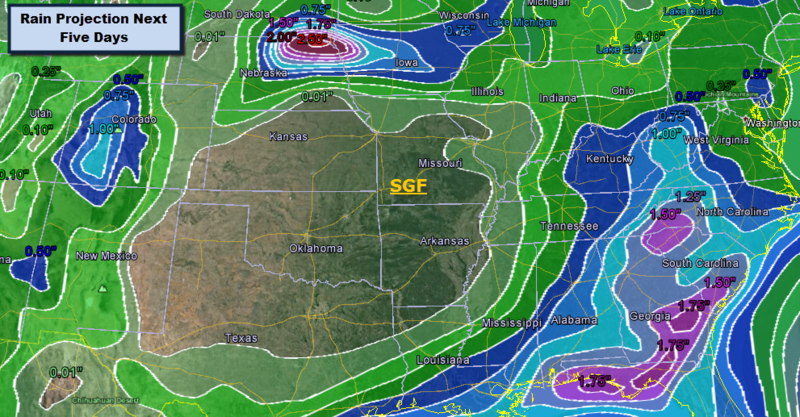 There are some indications that the ridge will hold even into next week. 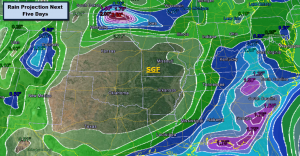 Unlike the pattern of much of June and early August, all meaningful rain chances have disappeared from the forecast for at least the next week. If your pool hasn’t gotten much use lately, this next weekend might be your ticket!